Discussion in 'General Skiing' started by Tricia, Mar 14, 2019. Most of us will admit that we have experienced fear at some point in our skiing; some of us will even admit that fear has paralyzed us at one time or another. I recall a day when I was standing at the top of AMF at Snowmass; I was focused on a rock at the entrance. All I could think was, “I can’t do that; there’s a rock right there!” Weems was right beside me, coaching me on how to make the turn and avoid the rock. I just stood there paralyzed. Finally, he said abruptly, “Just make the damn turn!” That shocked me into moving, and guess what -- I made the turn. Fast forward 9 years. I rarely have moments that paralyze me with fear, but I also tend to stay in my comfort zone, aside from dabbling here and there when I’m inspired do something a little riskier. When the opportunity arose to attend the Art of Fear Camp at Alta with US Ski and Snowboard Hall of Fame inductee Kristen Ulmer, I was more than a little excited. Imagine taking a camp about fear with someone who has accomplished so much in a sport that carries a lot of risk! Kristen has accomplished many things in the ski industry. She was the first female to ski the Grand Teton; she was voted most extreme woman athlete in North America; she has been filmed in many ski movies where she stunned audiences with her risk taking. Kristen retired in 2003 to study and teach people about fear. 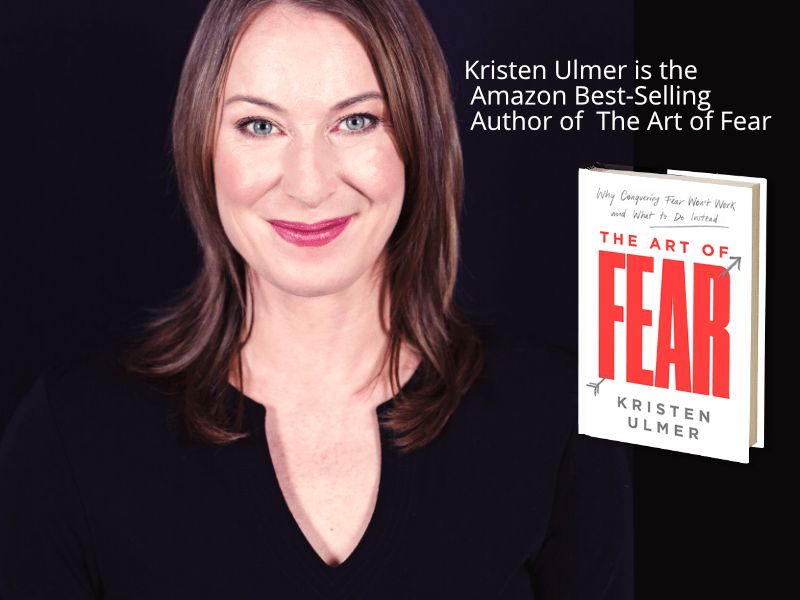 She has facilitated many people, including top athletes, by teaching them to stop trying to conquer their fear, which never seems to work, and instead to create an intimate relationship with fear by using it to empower the very thing that caused the fear in the first place. Now about the Art of Fear Camp: first let me say that I will be touching on my personal experience and how I “shifted” (more on that later) because the method that Kristen has developed is something to be experienced in a personal way and not something that I can describe in detail without diluting the camp. It isn't a typical clinic where you work on skiing skills or tactical instruction to get past a plateau in your skiing; it is more about learning methods to get you out of your own head when skiing. We started the day with a little exercise about hope. Where most meditation methods have you breathe in the good and out the bad, Kristen asked us to think about one personal fear and to breathe in that fear, then to breathe out any hope of getting rid of the fear. Let that sink in. Breathe out any hope of getting rid of the fear. This exercise brought me to tears, because for the first time I recognized a fear that I had no idea existed, and it touched me in a very personal way. Once we moved on snow, we started to "shift." This is an exercise where we recognize the 10,000 voices in our mind and body that talk to us through everything we do. These voices are literally everything that speaks to us, whether it's the voice that controls, the voice that regrets, the voice that feels fear, or even the voice of fear itself. When Kristen asked to speak to a voice, it was time to set our habitual self aside and make a physical shift -- whether it was shrugging the shoulders, wiggling the body, or clicking the poles -- and let the voice that Kristen asked to speak to take over in that moment. The first voice was the controller. As the camp went on, we continued to acknowledge the roles of the 10,000 voices and the importance that each of those voices plays in our life -- in this case, our skiing. When we got to the voice of fear and realized that fear had been banished to the basement because we were resisting it for most of our lives, it became clear that fear would get restless and rattle the pipes in the basement, which would in turn rattle us. What do they say about fixing problems? Recognizing the problem is the first step in solving it. Recognizing that fear is an important voice in the 10,000 voices is the first step to unlocking the basement door and creating an intimate relationship with it. That is not how Kristen set us up for the final run of the weekend, and the final exercise. Imagine that there is a comet headed for Earth, and in less than 2 hr, Earth and everyone on it will perish. Ski the last run like it's the last run of your life. Ski it looking at the other skiers around you and realizing that they are going to perish too but they have no idea. How do you ski it, knowing that This Is It? After that last run, I watched campers walk into the meeting room with a variety of emotions. Some were in tears, some needed silence, and some wanted to talk excitedly about the wonderful feelings they got, but one thing was clear: everyone was affected. This camp can’t be compared to any I’ve ever attended. This one opens your mind and centers your body to embrace voices that you may have never thought about. Don’t let fear rattle your pipes; let it empower you. "I learned about Kristen's Fear Camp while attending a showing of her new movie, Voices of Fear, at REI. I knew instantly that I wanted to attend and explore my own relationship to fear. Knowing Kristen's background and accomplishments as a big mountain skier made it easy for me to trust that she had something important to teach me. Fear Camp was a paradigm shift that opened my eyes to new possibilities and a new way of 'being' me - only better!" ADKmel, elemmac, AmyPJ and 3 others like this. Wow, very interesting. She put a lot of things together (NLP, Parts Therapy, CBT) and come up with something fascinating. One of the stand outs for me is the variety of people in this camp. Some were deeply moved by the method and have been transformed by the weekend. I don't think its about the camp as much as it is about the "place" where the person attending is in regard to how much it will resonate. The hope of this article is to promote The Art of Fear and help people have a good understanding of it so they are informed when they sign up for it. RuleMiHa, socalgal and AmyPJ like this. What I like about her approach is that fear transcends and wiggles its way into ALL aspects of life. Fear and anxiety go hand-in-hand. When I was going through my divorce, the fear GREATLY carried over into my skiing. What was supposed to bring me joy and a reprieve from the fear I had of my future, became something I didn't particularly enjoy for that season, and all the way into this season. So, it bled into 3 ski seasons. I read her book, and stopped being so hard on myself, and embraced where I was (and am) and the fear that came along with it. Throw in my tibial plateau fracture 4 years ago, and it was a lot to push through. By embracing the fear, I finally quit having flashbacks to the injury this season, or at the very least, didn't let them "get into my head" like they used to. KingGrump, raisingarizona, RuleMiHa and 2 others like this. @Tricia I enjoyed your review of fear camp especially the part about the last run. As a senior skier I find that every day I am on the mountain I can not help but think is this going to be my last ski day. It is not a reason to ski without fear or to ski over my ability but just to enjoy the the moment weather it is a black diamond or a green slope for the beauty of skiing. KingGrump, Jerez, RuleMiHa and 1 other person like this. It is not a reason to ski without fear or to ski over my ability but just to enjoy the the moment weather it is a black diamond or a green slope for the beauty of skiing. That's pretty much the point of this camp. You don't want to ski without fear. Fear has a purpose, but you can be okay having a bit of fear and saying, "thanks for keeping me alive, now I'm going to do this." What do youthink of doing this on snow? In a way, seems like that's what could frustrate people. Maybe a night/early morning session then go out would be better? I know we have a separate thread about fear, and for me it comes down to two fears one is being hit by another skier or boarder the other about a balance between skills/speed vs conditions. When I say conditions it is ice, steep, grooming/snow depth as well as equipments/tuning. I did not attend the camp, but my guess is that the on snow aspect is critical. Fear is a very physical thing and in order to embody the experience I think it would be difficult if it was abstract or in the head without the physical confrontation. This sounds very interesting and not necessarily for ski improvement but for life. Still, it is tough for me to visualize how letting my fears out of jail is not going to be debilitating. While I think some of the basic beginning could have been done inside, the part where we let a voice inside take over and ski with that voice was an essential part of the method. I guess I'm too much of an engineer to accept this approach. 2) the longer you stand here the more freaked out you are going to get. So I chose to go first and just did it. After the first turn I was nervous at times, but no longer afraid. KingGrump, Uncle-A and Erik Timmerman like this. This is precisely why there are different approaches for fear camps. There was a woman at the camp who had done a Mermer Blakesly Out of the Yikes Zone camp and said it was completely different. Mermer's approach is technical skiing based where Kristen's is (for lack of a better term) Zen based. Both have their merits depending on the individual taking the camp. I am pretty sure that @silverback's wife is in the same camp that you're in. The fact that Kristen is one hack of a skier and has skied the most extreme runs I'm gonna say she has experienced fear of those extreme circumstances. How does she relate to the intermediate struggling with a black diamond trail? Many top athletes don't get the issues the average person has adjusting to what comes naturally to them. That is one of the reasons that average athletes make better coach than the super stars. I believe her entry into the field was at some point well into her career she became paralyzed by fear. That's what I remember from her interview, but not the specifics. I'm assuming that you meant she's one heck of a skier. She actually touched on that because she has felt fear in other aspects of her life where she experienced being an intermediate. She uses that experience to try to relate to the intermediate skier. She talked about how she was naturally good at skiing but wasn't invested in it until after she was 20. She just liked skiing hard and showing off. When she found out that she could be a serious mogul skier, wow! Yes, she became physically sick from fear which is why she developed this method. You are correct HECK of a skier, my typing skills on my phone are only so so. If you only knew how bad mine are on my phone. Funny enough, reading this thread, I recalled an event on skis that scared the crap out of me. It's my avatar photo. What you don't see that's just out of the picture is a wide, 20-25' deep glide crack that we had to get over with some speed. We had no business being on that particular aspect at that time of day in those conditions. I'm making a turn to get out of a potential slide path and hoping this doesn't go as I try to scrub some speed. Wet, heavy, spring corn and mank... west facing... late May bc touring.... if it had slid and you managed to get tangled up in it, you'd have been torn apart on the way down about another 1500 vert. ft of a 40-45 degree pitch. Really stupid. The following day it took me about 30 minutes to get myself together to do the first pitch of the day. .... I just stood there and stared at it for what seemed like forever. Might have been the most scared I've ever been on skis, and completely irrational compared to the potential poor outcome of the previous afternoon. Sounds like the camp was both different and amazing for you Trish. I think there's a place for many different focuses on the hill. Pretty cool that she's sharing what she knows. Fear on the hill is real. We see it every day in lessons. Even strong skiers brake across rather than commit themselves to skiing fall line to fall line. And yes, it trickles through how we manage life. Different sport, but I've always thought sailing was a great team builder and indicator of how others on the team dealt with fear and stress in challenging conditions. AmyPJ and James like this. Interestingly enough, I knew the camp affected me, but I wasn't exactly sure how, or why, but I've noticed changes in my approach to a few things that I know were influenced by this camp and Kristen's approach.